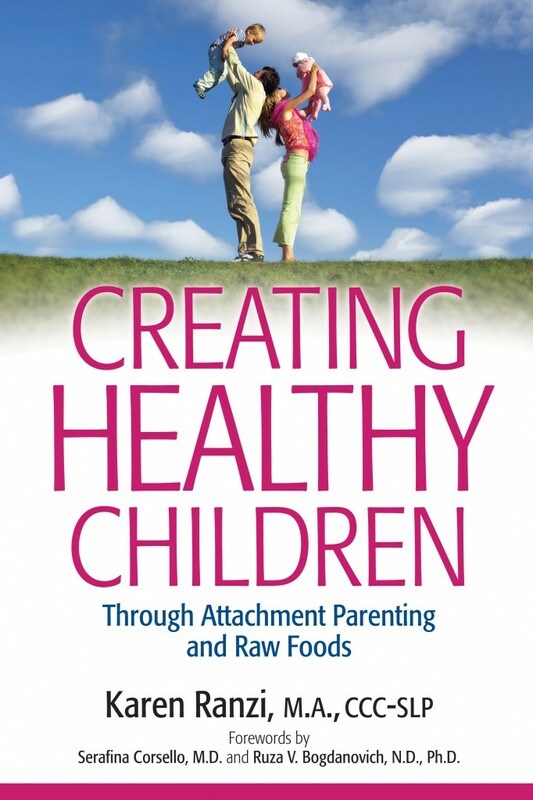 Creating Healthy Children is an empowering transformational book that will profoundly improve your family’s physical, emotional, mental and spiritual wellbeing. In this book, Karen Ranzi guides you on the path to creating happy and healthy children, confident of their disease-free future. Rather than medicate your child’s diseases, infections, and learning difficulties, Karen’s unique and proven approach simply eliminates the causes of health and weight problems through the healthful raw food lifestyle. She conveys the understanding of your child’s biological need to obtain optimal nourishment—implementing healthful choices from pregnancy on. Karen also emphasizes fulfilling your child’s emotional needs by adhering to attachment parenting principles throughout the growing years. Is Vitamin B12 necessary for mothers and children? 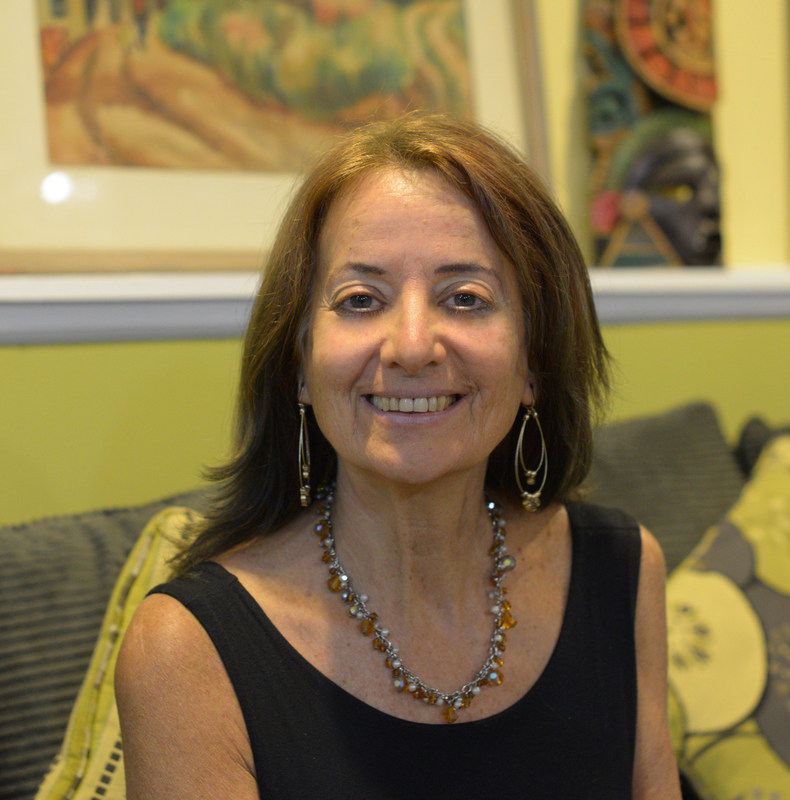 Mother, author, lecturer, and raw food consultant, Karen Ranzi is an expert in vegetarian and raw food parenting and has presented her class, “Creating Healthy Children,” at seminars, festivals and health institutes and on radio and TV since 1995. Karen was able to bring about the conditions for healing herself and her children simply through improving eating habits. Through tireless research, Karen has helped thousands of families and individuals reclaim their health. 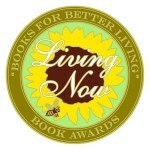 Karen Ranzi has written a most important book, Creating Healthy Children, that is must reading. The scientific evidence is now clear that a plant based diet means optimal health, and the sooner young people are started on this diet, the better. The story line in this book is personal, professional and very, very sensible. 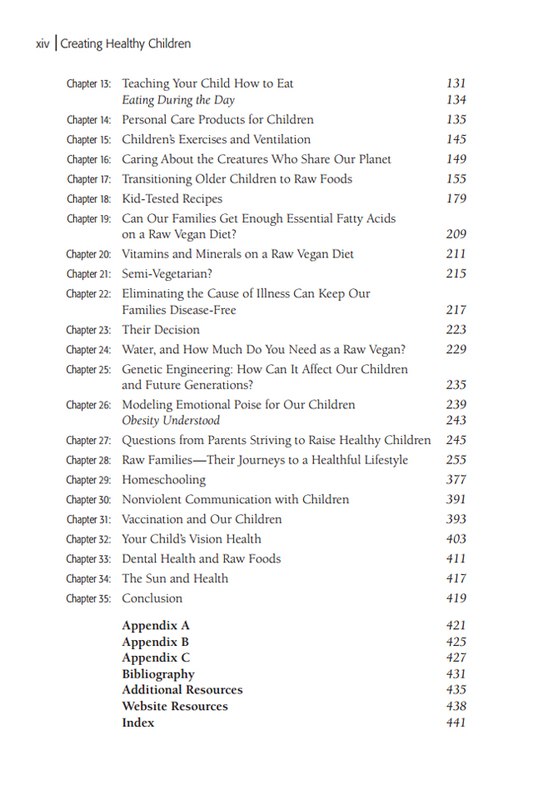 Creating Healthy Children is a valuable compilation of research and findings on different aspects of children’s health. Karen Ranzi is an honest researcher and a dedicated mother, and I envision this book being embraced by all loving parents seeking optimum health for their children. Karen’s bold suggestions, sincerity, passion, genuine style and interjection of personal anecdotes make this book a valuable read. — fresh unpasteurized goat milk ? — vita-mixed fresh, organic fruits and vegetables ? — some combination of the above ? Thank you so much for your message and questions. A baby under 1 year old needs a milk source for quality fat and protein. Many mothers have mistakenly stopped breastfeeding and fed the child solid raw foods instead. Mothers milk is crucial during this time and the first step would be to see if a lactation consultant from La Leche League can help the mother to nurse or increase her milk supply. This can often be best as mothers milk is by far the best for baby. If a lactation consultant is not successful, then the next step would be to look for a wet nurse, someone who will be willing to donate or sell her milk. Some women are even able to eat healthier if being paid for their milk. There are also website such as Milkshake in which mothers milk is donated. A last resort would be unpasteurized goat milk which is from a smaller animal than the cow. It’s not ideal because it’s still much higher in protein than human mother’s milk and is difficult on the baby’s digestion, but is preferable to cow’s milk. It could be mixed with carrot/celery juice. In no situation do I recommend formula. It’s toxic to the baby, has little in the way of natural vitamins and minerals, and should never be used. As we spoke by Skype, I believe your child needs a milk source, preferably a mother’s milk, until at least one year old. Formula should never be the choice as it’s loaded with toxins and minimal amounts of vitamins and minerals. If you cannot find a wet nurse or mother who will donate her milk, then fresh unpasteurized goat milk would be the last choice. You could provide half goat milk and half carrot/celery juice to start bringing in some nutrients from vegetables. Hi. I am a mum of a down syndrome baby. He is now nearly 6 months and everyone it telling me to wean him as I exclusively breast feed. I want to know what I need to feed him next and what your advice would be as he is getting hungrier by the day and I am getting quite tired of feeding him every 2 hours in the day! Do i feed him purees and baby rice?? Does your book state what foods to eat around this stage? First, I would like to know why people are telling you to wean your baby at only 6 months. Your breast milk is the most important nourishment you can give to your child. It has all the protein and fat perfectly meant for the growing human baby. An absolute minimum of one year is required, and I recommend longer and letting the baby decide when to wean. As you move toward the end of the first year of infancy, if the baby shows signs of wanting to eat then you can start with bite-size pieces of ripe fruit such as speckled bananas chopped in small pieces so that baby learns how to properly chew. Please do not start with purees and baby rice. If you start with purees then baby will not learn how to chew his food properly. Baby rice is highly processed and oxidized after sitting on the shelf for long periods. Also, children under age 3 do not have the salivary enzyme ptyalin or the pancreatic enzymes to digest starches of any kind. 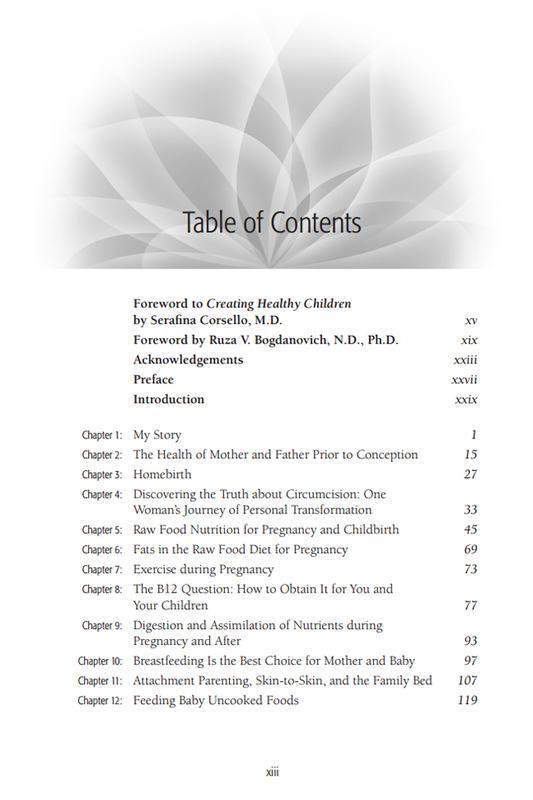 Yes, my book Creating Healthy Children states what foods to eat as you are introducing foods to baby and the sequence in the chapter on “Feeding Baby Uncooked Foods.” Thank you so much for contacting me! My son has just been diagnosed with adhd. Hes 4 in March and I have had a very rough time with him so far. I had so many plans for how I wanted to raise him and hes been such a difficult child that nothing I intended has worked out. Hes not vaccinated, he eats a mainly vegan diet (some eggs very occasionally because of his father or treats with dairy in them) I am doing my best to have him eat fruit at least during the day but he has massive fits if he doesnt get something else. I feel frustrated and at a loss. I am ordering your book and pray it gets here soon. Some days are so bad. Hi Amanda, I wanted to find out how you are doing with your son. It sounds like you don’t get the support you need to follow a healthy vegan lifestyle that could have the positive effect of turning around the ADHD. Many children have made significant improvement by moving to a whole foods plant-based lifestyle but I would need to know further about what he’s actually eating. I offer a free strategy session to find out what you’re doing not, what’s working and not working, and strategies for healing. if you are interested in the free 40 minute strategy session, you can contact me at karen@superhealthychildren.com. hello! first of all ,im a vegetarian who eats chicken a few times a week. my youngest daughter is25 months, and she wont go to sleep until 10 or 11. in conclusion, I feed her fruits ,vegetables and dehydrated snacks. Hi! Great to hear you want your whole family to be vegan. A vegetarian does not eat chicken as it’s meat. According to Dr. Michael Greger’s book How Not to Die, chicken is even worse for your health than meat. The buildup of arachidonic acid in your liver from eating chicken and fish is the cause of numerous generative diseases. I recently heard a medical doctor, a neurologist, speak about the salmonella in chicken and that 97% of the chicken today is poisoned with salmonella. I’m glad you adored the article and are trying to get your whole family to be vegan. It can be a very smooth transition. If you are interested in coaching to get your family to a healthy vegan lifestyle, I’m available for a 40 minute free strategy session when you contact me at karen@superhealthychildren.com.